we are manufacturing all across the nations for the convenience of our clients. Our products are made up of premium quality raw material and are well known for their latest and exclusive features. These are good abrasion resistant and are highly durable in nature. We are leading manufacturer of Steel Pinch Rollers with difference type of variety. 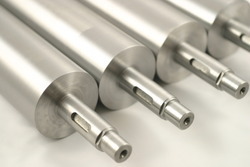 We are the largest producer of Pinch Rollers. Our consumers can benefit these vast ranges of products in different stipulation as per their requirements. This item is well built and gives excellent performance for a longer period of time. Besides this advantage, our products are effective and have high weight bearing capacity. We are one of the prominent firms, engaged in offering a supreme quality range of Printer Pinch Roller. Our company has created a niche in the field of offering Polyurethane Pinch Roller. We manufacture Rubber coated and Case Hardened Pinch Rolls varied upon different applications and requirements. Rubber Coated Pinch Rolls are made in Neoprene or Hypalon Rubber with hardess 85-95 Shore A.